If you’re of a certain age and cultural inclination, you may remember Alan Watts as somebody who influenced your entire approach to life. Lately I have asked many people to reflect on this man and often have been met with some combination of nostalgia and gratitude to him. 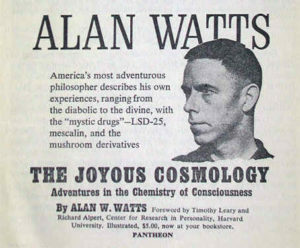 In his years of greatest fame and influence, Alan Watts disparaged himself as a “philosophical entertainer”, yet his depictions of Eastern spirituality and the contemplative traditions of Christianity, together with an appreciation of western science and psychology, make him one of the creative spiritual minds of his generation. Decades after his death Alan Watts has had a continuing influence. 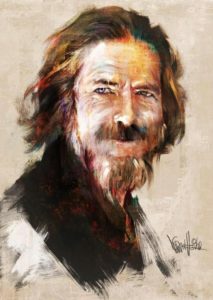 Alan Watts died in November 1973 at the age of 58; he would have had many years remaining but for afflictions of fatigue, alcoholism, and heart disease. I was in college when Watts died and knew of him from my intellectually-minded spiritually-aspiring friends. A few months after Watts died I took my first course in oriental philosophy, but that’s my biography, not his. Alan Watts wrote twenty-five books, the first one when he was in his early twenties It seems that wherever his interests turned another book was being written. Some of his best-known titles indicate the range of his work: The Meaning of Happiness (1940), Behold the Spirit: A Study in the Necessity of Mystical Religion (1947), The Wisdom of Insecurity (1951), The Way of Zen (1957), Nature, Man and Woman (1958), Psychotherapy East and West (1961), and my favorite title, The Book: On the Taboo Against Knowing Who You Are (1966). Many recordings of his lectures given for radio or on the college circuit continue to be available. Today when I read his published work or listen to his talks I am stunned how well they have stood the test of time, how much insight displays itself, how much wiser Alan Watts was than what he could realize for himself. Note the gentleman’s pipe together with the beads and “mod” shirt. Never quite fit in anywhere. Here’s a video from the 1950’s before he began to look and act like a wise man of the counterculture movement of the 1960’s. You will notice a fading English accent, a serious and somber demeanor, and a presentation that is clear and compelling. Here’s one from the 1960’s where he adopts a more deliberate image, perhaps a cross between a West Coast hippie and a Taoist sage, one that you may find pretentious. Once again, however, he brings intelligence and clarity to his presentation. During the 1960s on the west coast, he reveled in the counter-cultural life-style with all its famous excesses, yet always with an inquisitive and critical mind. One might charitably say that Watts’ personal life was turbulent; “messy” is probably closer. Two of his marriages ended in difficult divorces: the first one was annulled under odd circumstances, and he left his second family in 1960 at the age of forty-five. (He married again soon after both marriages ended.) Although Watts was attentive to and playful with his children, the responsibilities of parenting were somewhat over his head. His relationship to money was also problematic: he was fortunate that his first wife came from a wealthy family; the divorce from this second wife left him with so many alimony and child-support payments that his only recourse was his final years of overwork. 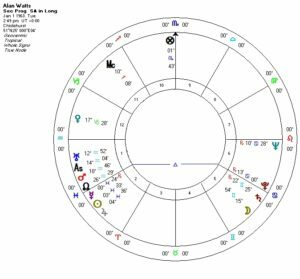 Applying astrology to Watts’ lifework and legacy, many would seek out Uranus and Neptune in his chart. He seems to exemplify Uranus’ unconventional and ingenious nature. Alternatively, Neptune is inclined to a mystical approach. 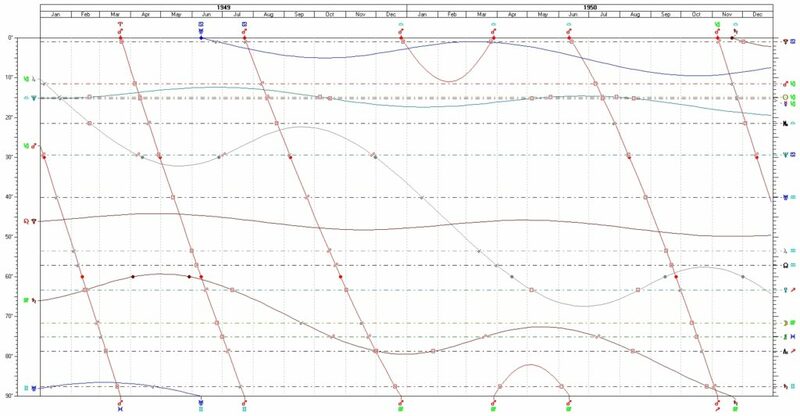 Yet neither planet is prominent in his chart, nor is either strongly-placed in the harmonic charts I’ve looked at. As we will see, Pluto is a different story. Watts turns out to be unexpectedly Saturnine, with Mars, Sun and Mercury all close together in Capricorn and with an important mutual reception between Saturn and Mercury. Alan Watts’ surprising natal chart. Click for a larger picture on a different tab. We first see Mars who loves being in Capricorn, its sign of exaltation. We will discuss an important configuration with Mars in a moment. Astrology’s Sun depicts how one radiates, what experiences and situations bring out the most aliveness in the individual. Unlike Moon that is adaptable and operates instinctively, Sun is conscious, intentional. A cardinal sign like Capricorn is apt to take the initiative; as a sign governed by Saturn, Capricorn creates and relates to internal intention and external structure. Soaked in his early Anglican environment, and later being an Episcopal priest (two words, same religion), Watts intensely criticized but never completely left his childhood spiritual upbringing. Nor had his excursions into Eastern spirituality an air of dilettantism or idle curiosity or exoticism but commitment and just enough critical distance to be credible. From an early age he deliberately cultivated relationships with notable people in the fields of Eastern and Western religion and psychology. Although his career and life-style had many changes, the main goals for this lifetime, seemingly fashioned when he was about fifteen years old, never wavered. Here’s an illustration of Watt’s rootedness is found in his essay “Beat Zen, Square Zen, and Zen”, written sixty years ago when the words “beat” and “square” divided the world into cool/unconventional and muggle/conventional. He notes the increasing popularity of Zen, divided into the “beat” version that is creative but can be too subjective, capricious, or just lazy, to the “square” version that is too austere and conformist, relying on a kind of spiritual athleticism, what he would call being “superhuman”. How do these extremes come about? By people not understanding and reconciling themselves with their inherited traditions that will consequently manifest themselves unconsciously. Mercury in not essentially dignified in Capricorn but has a mutual reception with Saturn – Mercury is in Saturn’s sign Capricorn and Saturn is in Mercury’s sign Gemini. As these signs can “see” each other, this is an important relationship in his natal chart. 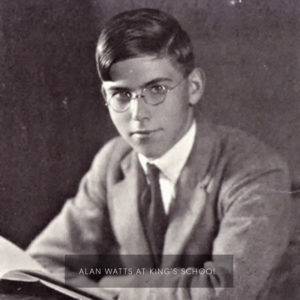 After leaving school Watts embarked on a multi-year program of self-study and immersed himself in Eastern and Western philosophy, religion, and psychology. Later he taught himself Chinese calligraphy and writing and Asian poetry. Mercury/Saturn, at its best, is well-known for clarity, for distilling clear messages from complexity, like the complexity of comparing different religious traditions in an objective manner. Gemini gives Saturn greater mental and emotional flexibility, although diurnal Saturn is out of sect in Watts’ nocturnal chart. Watts seemed to have none of Saturn’s renowned oppressiveness, bitterness, or cynicism, yet, from time to time, he carried some of the planet’s discouragement and frustration. Alan Watts’ Moon in Virgo is in an applying trine to Mercury. We note one of his central messages: approaching spirituality with superhuman ambitions and expectations is counterproductive; instead it is far better to use spirituality to break through our unexamined socially conditioned thinking that leaves us separate, alienated from the natural environment, the richness of who we are, our own bodies. Watts’ attraction to Zen was its simplicity but also its directness that can help break what William Blake called our “mind-forg’d manacles”. 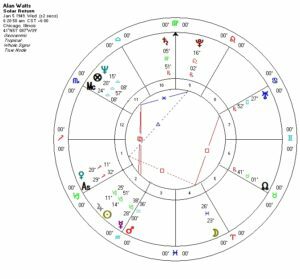 We also look at a Virgo Moon’s capacity for discrimination, for Watts found much to criticize within the Eastern religious traditions as well as those of the West. He disliked absolutism, conformism, and negative depictions of human nature. His message was uncompromisingly positive, at least in its depiction of our possibilities. Moon is in Watts’ Tenth House of career. As a young adult he had to improvise his livelihood; later, as counter-cultural sage in the 1960’s, he showed an ability to adapt his work to the current moods even if his more refined sensibilities bristled. He looked the part but was too orderly, to neat and tidy, too much of a serious scholar, to be entirely comfortable within a counter-cultural “hippie” culture. We finally arrive on Mars. 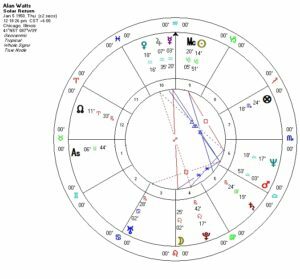 Watts chart with his Ascendant-Mars-Pluto configuration highlighted. No easy-going man! has a symmetrical relationship to his Ascendant in Sagittarius – both Mars and Ascendant are about twelve degrees on either side of the Cancer-Capricorn axis, and are strongly tied together even if they are in signs that have very different energies to them. Traditionally this is called “antiscia.” This becomes especially important when we note Pluto’s position at the very beginning of the sign Cancer and so this antiscia configuration includes Pluto. Those who use midpoints would see Solstice Point = Pluto=Mars/Ascendant. 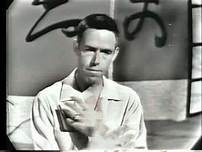 Nobody would confuse Watts with a “laid back” person, in spite of any stereotypes we may have about Zen and meditation. This configuration gives much intensity and energy, but toward goals of one’s own making, not those imposed from outside. We must also attribute to him a messianic sense of his own destiny: he had a clear sense of calling as one to renovate the religious and cultural attitudes of his personal upbringing and Western spirituality in general. If his personal and domestic life suffered in consequence, so be it. Contrary to a quick reading of this configuration with Mars and Pluto, Watts did not harbor anger, resentfulness, or bitterness, and instead tended to focus on the positive in others. He was not domineering, although no doubt he had a controlling streak that was probably unattractive in his personal life. This brings us toward the benefics or “good doers”, Venus and Jupiter. In other astrological profiles I usually begin with the Ascendant, any First House planets, and the condition of the planetary ruler of the Ascendant. We have finally arrived at some of Alan Watts’ most transparent qualities. We note the effusive upbeat nature of Sagittarius rising and we see that Jupiter, the planetary ruler of Sagittarius, is in Aquarius; this supports a humanitarian vision and way of manifesting. Watts felt he could help change the world, or at least move it into a more tolerant and open-minded direction. His interests included environmentalism and systems theory, both being modern western expressions of seeing ourselves and our worlds as interrelated and integrated, as opposed to the isolation and the harmful materialism he saw in modern society. Jupiter’s placement in the Third House would be uninteresting to many modern astrologers – isn’t this the house of information, knowledge, questioning? Within the ancient tradition, however, the Third House was the “Place of the Moon Goddess” and would signify dreams, mystic visions. One could include the private spiritual life as opposed to the public and institutional that is signified by the opposite Ninth House. It is not surprising that Watts was interested in the intimate nature of personal spiritual practice as opposed to the constricting qualities of many established religions. According to the Whole Sign House system, a planet in the same sign as the Ascendant would be in the First House, even when a planet is in early degrees of the sign and the Ascendant degree is much later in the sign. Using a Whole Sign House system, Venus in early Sagittarius is in the First House, not the Twelfth. Venus in Sagittarius is exuberant, expressive, often expecting too much from love and sexuality than going to happen. Sometimes there’s romantic expression affiliated not with a partner but a “soul mate”, and possibly the conviction that longing and sexuality can uncover one’s higher nature within our ordinary lives. There’s a lot of expectation here. Many astrologers, who would place Watts’ Venus in the Twelfth, would interpret Venus as pointing to some kind of undoing. Indeed, his sexual behavior did “cause pain in his marriages”. Venus in the Twelfth indicates that romantic love and sexuality were alienated or repressed parts of him that could emerge from below to cause unanticipated harm, like some American politicians who moralize about others’ sexual behavior until they’re caught with their proverbial or actual pants down. Alan Watts was different from all that. As s young person he was already troubled by his church’s view of sexuality; took both Western and Eastern religions to task then they appeared too prudish, too unforgiving of sexual drive and pleasure. One could make a strong case that Watts’ sexual nature was a cause for his spiritual life and a source of his creative approach toward spirituality, not an undoing of them. With every natal chart I examine the Lots of Fortune and Spirit closely, for they signify features of our lives with limited control and those in which we may exercise a range of choices. In a worldly sense, Alan Watts is one lucky guy. While many of us creative people have done our time flipping the proverbial burgers, Watts’ Fortuna in Aries has its ruler Mars, Sun, and Mercury in Tenth-House relationships and Jupiter in the Eleventh from the Lot, what Vettius Valens called “the place of acquisition”. He was too principled to be a gold-digger yet managed to marry into a prosperous family; his visit to California, at a time when he was relatively down on his luck, yielded a job offer that would later become his passport to prominence. His Lot of Spirit is in the Ninth in mid-Leo. Its ruler is his Capricorn Sun in a sign that does not aspect Leo. So far not very good. Saturn in the Eleventh Place is helpful and would enable him to use Saturn attributes consciously. More notable is the opposition from Jupiter, the lord of his Ascendant that can give ambition if not wisdom. The other benefic weighs in, as Venus is in a trine relationship by sign: this may point to his playfulness. What Do His Stars Say? Paranatella or “co-risings” bring together a planet with a star that rise, culminate, set, or anti-culminate at the same time during the day of one’s birth. Although Alan Watts was not born at sunrise, when the Sun rose in the sky shortly after he was born, the fixed star Alpheratz was also rising. This star, belonging to both constellations Pegasus and Andromeda, brings together movement and the feminine. This greatly helps mitigate Capricorn’s stereotyped aloofness and dourness for him. We also find that two stars of the constellation Orion, Betelgeuse and Menkalinan, culminate with his Saturn in Gemini. These are important stars in the constellation of the hunter and help give his Saturn greater flexibility but also drive, perhaps the attitude of a warrior. At the exact time of Watts’ birth, the fixed star Spica was culminating. Spica is the most visible star in the constellation Virgo, representing the wheat in the left hand of the maiden, and therefore indicates fruitfulness. Spica is one of the most favorable fixed stars used by astrologers, and culminating indicates that this star may yield its harvest during the prime of one’s life. As a star in a zodiacal constellation, conjunctions to the zodiacal degree are often traditionally preferred. 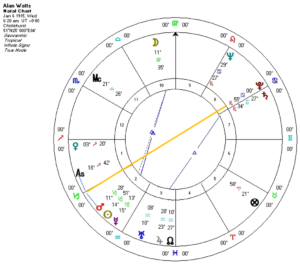 The zodiacal separation between Watts’ Midheaven degree and Spica when he was born was one degree thirteen minutes: a change of less than a minute would put Spica within one degree of the Midheaven degree in his astrological chart. Alan was raised within a well-educated Edwardian milieu; his mother’s side was involved with evangelical Christianity and he was raised in an open-minded but religious environment. As a young person Watts was intrigued by the oriental art his mother owned and he became interested Asian culture. A precocious and creative only child, he was talkative, imaginative, and comfortable with adults. The austerity of his Christian background also frightened him. As a teenager when he decided to be a Buddhist. Watts was able to qualify for a scholarship to go to boarding school and was an excellent student. Based on reading a few books, one adult traveling companion, but mostly from intuition, at the age of fifteen he decided to be a Buddhist. He wrote to the Buddhist Lodge in London and soon met Christmas Humphreys, theosophist and Buddhist. This was the first of many mentor relationships Watts would have as a young adult. One year later, at the age of sixteen, Watts had become secretary for the group. Although he would later manifest as a Christian, this decision to a Buddhist set the tone for the rest of his life. In 1930 Uranus was in Aries and for several months was at station in the middle degrees of that sign, forming a transiting square to his Sun and Mercury. (Transiting Uranus crossed his Mars in early spring of that year.) This speaks to the intuitive – maybe impulsive – nature of his life choice, as well as its unusual and even rebellious nature. Mercury was also involved by secondary progression, since late in the previous year progressed Mercury was conjunct progressed Sun. This was a fertile time for him to learn and to set his sights on his range of study and investigation. Looking at his decennials for this time, he had begun a Venus major period when he was ten, since Venus in the planet that follows the Moon in his natal chart. In early 1929 his decennials were Venus-Mercury, again showing the importance of Mercury for him. In September 1930, Venus-Mercury became Venus-Jupiter that for him would signify widening his intellectual and personal horizons. 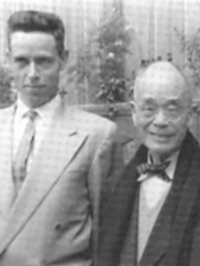 A later picture of Watts with D. T. Suzuki, a Zen master whose work helped Buddhism find a home in the West. They met in 1936 in an inspiring meeting for the young Watts. During this time, however, he spectacularly failed the examination for an Oxford scholarship and, since his family could not afford further education for him, he had to leave the academic world and find work for himself. He was thus deprived of the opportunity to meet luminaries like C.S; Lewis and J.R.R. Tolkien who were at Oxford at the time. Instead Watts began his self-study, took a couple of ordinary jobs, and increased his networking in general and also his involvement with the Buddhist group in London. Did Watts sabotage his qualifying exams consciously? There was surely an ingredient of rebelliousness, maybe the arrogance of many an intellectually-gifted male in his late teens. Had he gone to Oxford and excelled there he may have settled into a comfortable academic life and we of later generations would be deprived of his unique destiny. His calamity became our opportunity. As he was pursuing Plan B of self-study and a day job, his decennials changed to Venus-Saturn, of course. In 1937 he met Eleanor Everett from a wealthy American family and the daughter of a woman who would become a Zen adept in her own right. He and Eleanor married and in 1938 they went to live in New York and their first child was born. Eleanor’s financial means allowed Watts to continue to study and to join in with the Zen community in New York. By now Watts needed some direction in his life and it was time to move on. In 1941, at the age of 26, Watts entered the General Theological Seminary in Chicago with the goal of becoming an Episcopal priest. (He became an American citizen in 1943.) Because of his self-study he was ahead of the other students, and three years later (at the time of his Saturn return) Watts was ordained as a priest and was assigned to Northwestern University. Pay was low but he flourished, showing himself to be a dynamic teacher and guide to the community. He wrote Behold the Spirit, a book on Christian contemplation, that was reviewed as an important contribution to Christian literature of the time. While Watts was popular and successful at Northwestern his marriage began to fall apart. To make a painful story short, he had begun an affair with a graduate student, and Eleanor had begun her own extramarital relationship with Alan’s encouragement. After some attempts at reconciliation, in early 1950 they went to Las Vegas to get an annulment. Alan married again shortly afterwards. This did not sit well with the Episcopal hierarchy nor his university superiors and in mid-1950 Watts quit the priesthood just ahead of being fired. From the viewpoint of fame and finance this was a calamitous turn of events. He was deprived not only of Eleanor’s family funds but his small income as a university priest; by leaving the clergy Watts no longer had a clear career path. His transits point to Neptune and Saturn making life difficult for him at this time. Transiting Neptune in Libra was afflicting Sun and Mercury in Capricorn from late 1948 until summer 1950. Had he already lived in a less conventional way, perhaps the Neptune transit would have awakened his spirit. Instead his outer life fell apart, no doubt aided by his own inner confusion and perhaps self-deception. Saturn’s appearance in Virgo also afflicted Venus in Sagittarius and later Moon in Virgo, in his Tenth House of career. Saturn would do double-duty, affecting both his personal life and his career. Looking from the left to the right, note that the flattened Neptune line transits his Sun and Mercury. Saturn, wavier, transits Mercury and Moon among others. Click for larger picture. His decennials for this time show a more complex picture. He entered a Sun major period in 1946, coinciding with his initial success at Northwestern University. This was followed by Sun-Mercury and during the year 1950, the year of his annulment and leaving the priesthood, it was Sun-Jupiter! Jupiter specific periods last just about one year, conforming to Jupiter’s number. There’s something strange going on here. For Alan Watts all these problems indicated ending one chapter of his life to begin another. Interestingly, at the end of 1950 began a Saturn specific period that signaled his new isolation but also pointed to his incremental rise from starting over to prominence. Let’s compare his solar returns for 1949 as things were falling apart and 1950 when things got worse but then better. The solar return for 1949 seems very difficult: we like Venus rising in Sagittarius, and maybe that’s about his new marriage, but it’s governed by Jupiter in fall in Capricorn in the Second House. So much for the added income from his first marriage. The square from Neptune to Sun reflects his transits for that time. Conspicuously Saturn is in Virgo in the Tenth, his house of career. What began as an opportunity at Northwestern had turned into a major constraint. The solar return for 1950 has Taurus rising governed by Venus in the Tenth, keeping company with Jupiter and Mercury in the same house. Somehow his clerical fall from grace would not be the end of the matter but provided a new opening for his career. Just after the Neptune transit to his Sun and Mercury ended, in the summer of 1950, Alan and his new wife began living in Millbrook, New York, in a place lent to him by a friend. He began working on a new book, appropriately called The Wisdom of Insecurity. Financial peril was put off when Joseph Campbell managed to get him a grant from the Bollingen Foundation. This provided just enough comfort and opportunity for he and his wife to travel West during the following year. When they visited California, they fell in love with the Bay Area, and it was only a matter of time when they would move there permanently. At that time Watts received an offer to join the faculty at a new academic institution, the American Academy of Asian studies. In 1953, coinciding with his progressed New Moon, Watts and his wife moved to Mill Valley in Marin County, California. He would reside in that area for the rest of his life. By the mid-sixties he and his third life spent time at home between a houseboat in Sausalito and a cabin near Mt. Tamalpais. He also traveled extensively up to his death. Beginning his hallucinogen phase in the early 1960’s. Although he was not meant for educational administration, the Academy gave him a vehicle to reach a wider audience. The institute would close after a few years but by then his books, especially The Way of Zen, became widely read and his gifts as a teacher would manifest on the lecture circuit and on radio. He became interested in cross-cultural traditions of psychology and wrote Psychotherapy East and West. He would explore the mystical possibility of hallucinogens, write and lecture about environmentalism and alternative lifestyles. As alcohol and overwork was taking its toll, and as he proceeded to his third marriage, he was looked upon as the counterculture’s sage. His progressions that help us understand these years of greatest fame. You will notice that a few years previously progressed Uranus was in conjunct his progressed Ascendant, then progressed Mercury would conjunct his progressed Sun, and about a year afterwards he had a first quarter progressed Sun-Moon square. In different ways these point to reaching out into new areas of inquiry and activity, in his case becoming a very successful writer and lecturer. At the time depicted, retrograde Mercury was about to move back into Aquarius but first formed a trine to Pluto in the first degree of their respective signs. In the following year his progressed Sun was in conjunction with progressed Jupiter: the former lends toward an intensification of mind, the latter to expanding horizons for the mature expression of his world view. In the landscape of Spring there is neither better nor worse;The flowering branches grow naturally, some long some short. For someone with a discerning and critical mind and way of expressing himself, Alan Watts had a generosity of character; perhaps this is his Jupiter in Aquarius governing his Ascendant. His life and thinking helps set a standard for us living in more divisive times where people rush to define themselves — to ally with some but mostly differentiate themselves from others. 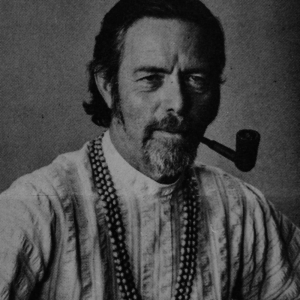 For somebody who wrote extensively about meditation, Alan Watts did not spend years in a Japanese Zen monastery like his friend Gary Snyder nor did he attempt an austere contemplative life like Thomas Merton. 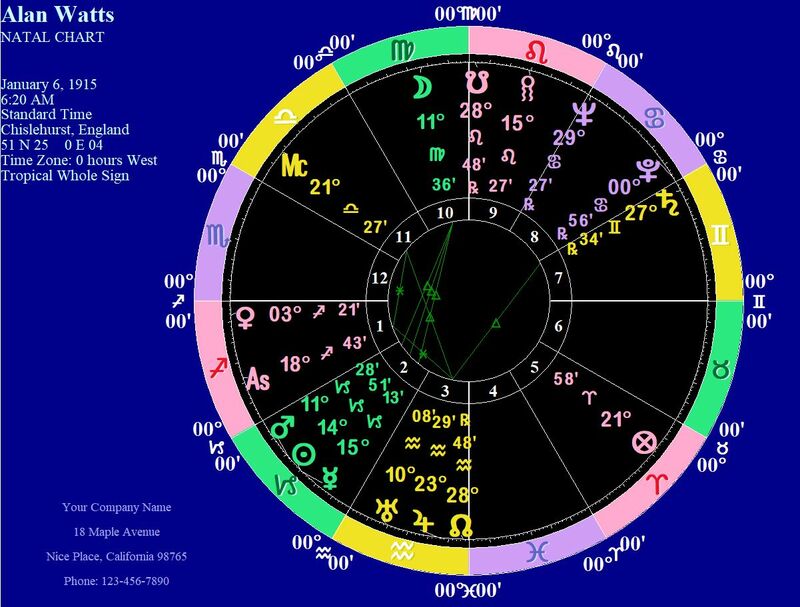 (Merton’s chart is awash with planets in fixed signs; Watts had only Jupiter in a fixed sign.) Perhaps excepting his performance on his scholarship exam for Oxford, Watts never exhibited a rebellious style but instead stood just slightly apart from any one tradition, except maybe Taoism with its completely un-doctrinare approach. This gave him a vantage point with which to extract what he felt was most useful to his audience and readers. This helped him be a bridge, between East and West, between traditional spirituality and modern thought, for many people to cross. The result is a body of work that is not dated nor naïve but a source of inspiration and understanding decades after our culture has moved past his salad days of the 1960’s and early 1970’s. During his lifetime Asian traditions had made a foothold in the West but there were very few people who could overcome the fascination of practicing an exotic spirituality and be a true practitioner. Alan Watts helped provide that possibility. Watts’ value may be seen in the esteem with which he was held by teachers from Asia whose work was to establish Buddhist communities in the West. Chögyam Trungpa, from the Tibetan tradition, counted Watts as one of his heroes and probably encountered Watts’ work in the 1960’s when Trungpa was a student at Oxford. He admired Watts’ sagacity and ability to speak the language of Western culture to aspiring students, although he also felt Watts’ personal experience with meditation lacked depth. Until his death in 1987, Chögyam Trungpa was brilliant at conveying Buddhist teachings to Western students and clearly learned much about this from the work of Alan Watts.